And yet, even as gamblers have continued to become more and more sophisticated about gambling, much of the casino table games pit has moved in the opposite direction, trending towards games which are often simplistic, and/or which require contrived strategies that even an expert poker player could not reason through. As a consequence, an entire class of modern gamblers is being underserved by the current casino offerings. 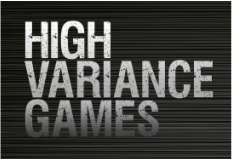 High Variance Games™ is the braindchild of Jeff Hwang, a poker player and the best-selling author of Pot-Limit Omaha Poker: The Big Play Strategy and the three-volume Advanced Pot-Limit Omaha series. The company was formed to bring a new brand of gaming to the casino floor in the form of a range of games designed to meet the demands of the modern gambler. Super Blackjack™ represents a complete re-imagining of blackjack, transforming blackjack from a relatively pedestrian hitting and standing game into an aggressive doubling and splitting game. Meanwhile, the poker lineup includes games built on a higher-action platform. This lineup ranges from the entry-level Three Card Stud Triple Draw™, which sets a new standard for action in a game with a single forced bet and a single 1x-3x betting round, while giving the player five cards to make a three-card hand while only giving the dealer four cards; Super Omaha Poker™, which takes flop action to a new level while eliminating the dealer qualifier; and Super Texas Hold'em™, the highest-action casino poker game ever devised with two progressively larger betting rounds. The pipeline also includes a progression of Asian card games, starting with Super Pai Gow™, the high-action game that Pai Gow always wanted to be; Open Face Pai Gow™, the next iteration; and Open Face Pai Gow Pineapple™, which will take action to a level far beyond anything ever seen in a house-banked casino Chinese poker adaptation. These are games for a more sophisticated gambler. These are games played on the draw. These are High Variance Games™.